If you do one thing today please check your blog subscriptions, update if necessary, and if you’re using the Blogger.com dashboard to read your favourite blogs, consider changing to something a little less flaky (I personally use Bloglines to follow my favourites). At the last count, there were nearly 40 bloggers in ‘google exile’ following the removal of the GFC service for non-blogger blogs. 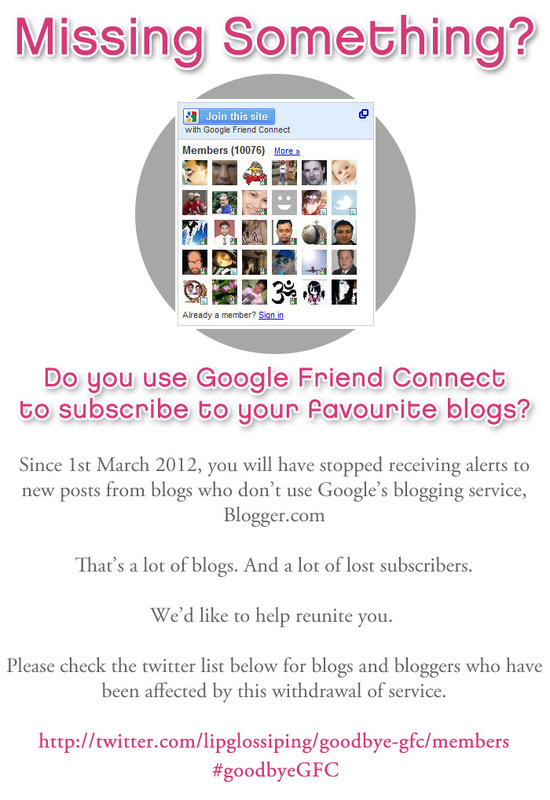 Have a look, you may even find your new favourite blog in the list. I just want to say a massive thank you to @tsunimee for helping me spread the word about this and for being the most passionate (if a little bit too passionate at times ;)) blogger I’ve ever had the pleasure of knowing. She fights for whatever she believes is right and she does it with gusto, as the French would say… formidable. Normal posting (and quite possibly a lot more of it!) to resume tomorrow, I gotta get my readers back somehow right?! Thanks for doing this!! I will post on my blog as well. I’ve now signed up to Bloglovin so I don’t miss out. My site is affected also I’d posted about this, fantastic idea!! I shall do as you have advised now. Taup-ally Obsessed with Maybelline's Silken Taupe!